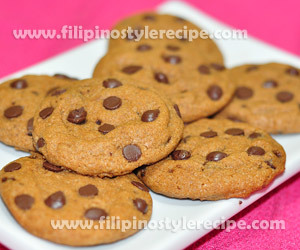 Filipino Style Recipe: Graham Chocolate Chip Cookies is another variety of cookies that can be served together with milk. 3. Stir in half of the chocolate chips. 4. Scoop batter using a medium cookie scoop and drop into baking sheet lined with parchment paper. Top cookies with remaining chocolate chips. 5.Bake into pre heated oven at 350 degrees Fahrenheit for 10 minutes. Remove from oven and let it cool before transferring to wire rack to cool completely. 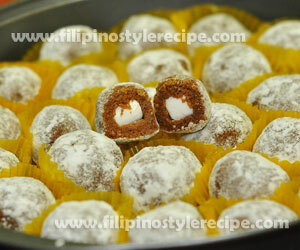 Filipino Style Recipe: Graham balls is another simple and easy dessert made of graham crackers. It consists of crushed graham crackers, condensed milk, evaporated milk and cinnamon powder mixed together until well combined. Mold into a ball shapes then roll in sprinkles and refrigerate before serving. 1. In a mixing bowl, combine crushed graham, condensed milk, evaporated milk and cinnamon powder then mix well. 2. 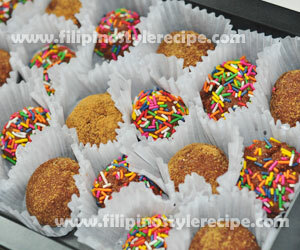 Scoop a spoonful of mixture then mold into a ball shapes and roll in sprinkles. 3. Place into paper cups then refrigerate for at least 3 hours before serving. 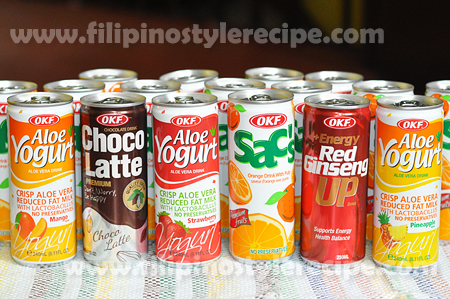 Filipino Style Recipe: Strawberry graham is another variety of graham float dessert. 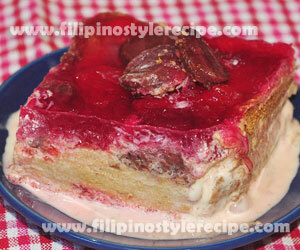 It is usually made with a layer of graham crackers, condensed milk, cream, gelatin and strawberries. 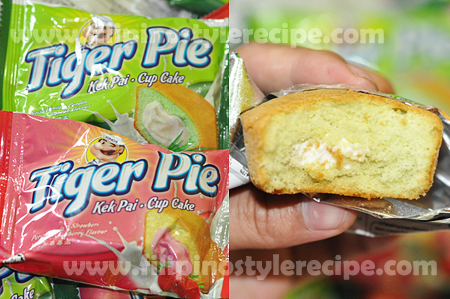 This dessert is one of the easiest and most favorite dessert of Filipinos specially during Holidays. 1. In large bowl, combine all purpose cream and condensed milk. Mix well and set aside. 2. In a square pan, dissolve strawberry gelatin based on instruction then set aside until firm. Break into small pieces. 1. In a rectangular container, arrange a layer of graham cracker then spread a layer of cream mixture. 2. Add a layer of strawberry gelatin and strawberry pieces. 3. Repeat steps up to the desired thickness(3-4 layer of graham crackers). 4. Add a final layer of cream mixture and sprinkle with crushed graham crackers then arrange strawberry pieces on top. 5. Store in refrigerator for 3 hours or overnight. Served cold. 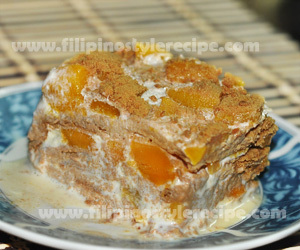 Filipino Style Recipe: Peach Mango Float is one of the easiest and most favorite dessert of Filipinos specially during Holidays. 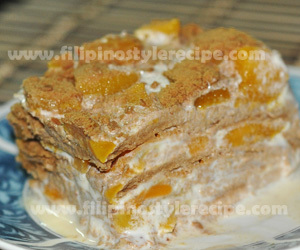 It is usually made with a layer of graham crackers and a blend of ripe peaches and mangoes slices, condensed milk and cream. 4. Add a layer of peach and mango pieces. 5. Repeat step 2 and 4 up to the desired thickness(3-4 layer of graham crackers). 6. Add a final layer of cream mixture and peach and mangoes pieces then sprinkle with crushed graham crackers on top. 7. Store in refrigerator for 3 hours or overnight. Served cold. 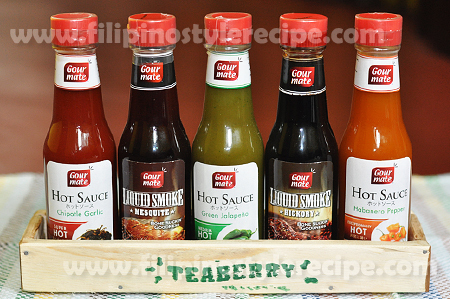 Filipino Style Recipe: Fiesta Float Graham is another variety float graham. 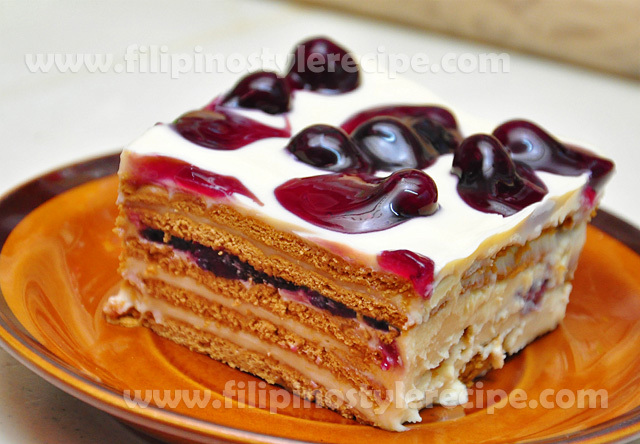 It is usually made with a layer of graham crackers, condensed milk, cream and different fruits. 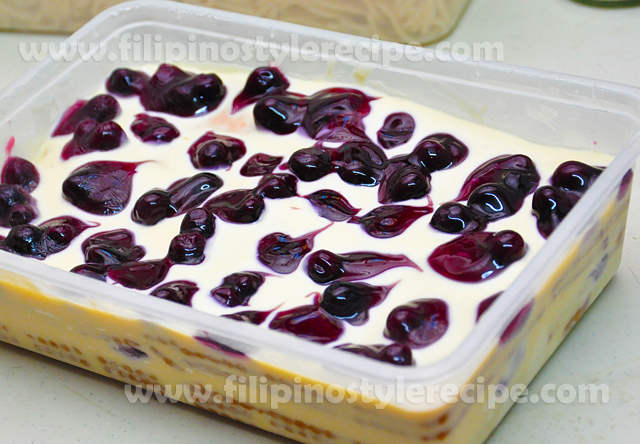 This dish is one of the easiest and favorite dessert of Filipinos specially during Holidays. 1. In the strainer, drain the fruits thoroughly for at least 30 minutes. 2. In bowl, combine all purpose cream and condensed milk. Mix well. 4. Arrange fruits over cream. 5. Repeat layering using remaining ingredients up to the desired thickness. 6. Add a final layer of cream and fruits mixture then sprinkle with crushed graham crackers on top. 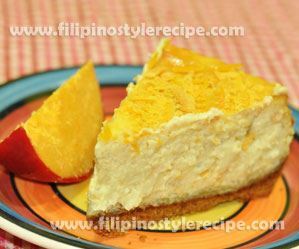 Filipino Style Recipe: Mango Float is one of the easiest and most favorite dessert of Filipinos specially during Holidays. 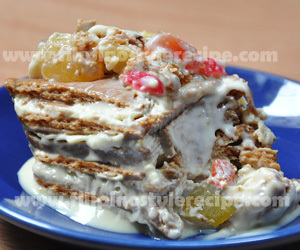 It is usually made with a layer of graham crackers and a blend of ripe mangoes slices, condensed milk and cream. 3 large ripe mangoes, sliced into thin and small pieces. 1. In bowl, combine all purpose cream, condensed milk and sliced mangoes. Mix well. 3. Spread a layer of mango-cream mixture. 4. Repeat step 2 and 3 up to the desired thickness. 5. Add a final layer of mango-cream mixture then sprinkle with crushed graham crackers on top. 6. Store in refrigerator for 3 hours or overnight. Served cold.